Level5 3" Angle head drywall corner finisher tool has been re-designed in 2016 to bring higher quality and value than previous Level5 models. Wheels have been added to decrease drag, and improve the ease of finishing drywall corners. Level5 made the wings and clips thicker for increased durability. Attachment is done through a locking clip - making sure that your investment won't fall on the floor. The blades have improved - full carbide is durable and finishes smooth. This all adds up to a great finishing head with an exceptional value. The Level5 3" Angle Head is an exceptional value for enthusiasts or contractors wanting to embrace production drywall finishing. Level 5 Angle Head attaches to any popular angle box or angle head handle and is Ideal for taping coat, as well as finishing door legs and other narrow angles. 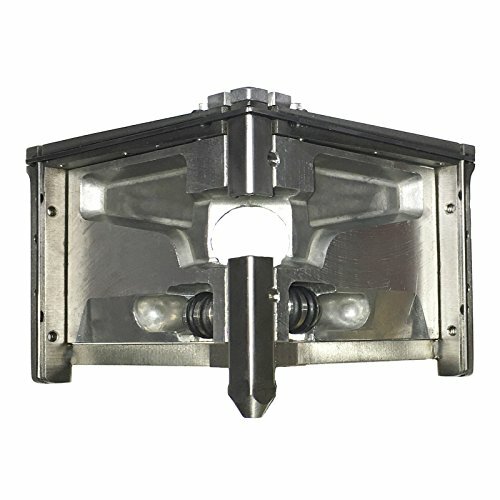 Sometimes called a glazer, Level 5 3 inch angle head is designed to feather a consistent, smooth finish on both sides of inside 90 degree drywall angle corners. After applying tape and setting with corner roller (sold separately), angle head is attached to angle head handle, and smooths first coat of tape consistently into the corner. By attaching angle head to angle box (also known as corner box) smooth finish final mud coat can be applied to inside drywall corner angles. Level5 3 inch drywall angle head works great for tape coat or final finish coat in narrow inside 90¼ corners. Compatible with any brand corner angle box or angle head glazing handle.